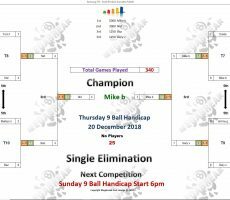 THURSDAY 9 BALL – 20th DECEMBER : MIKE WINS. “Brooklyn Bandit” Mike Berezovsky was back to winning ways on Thursday to win our 9 Ball Competition. 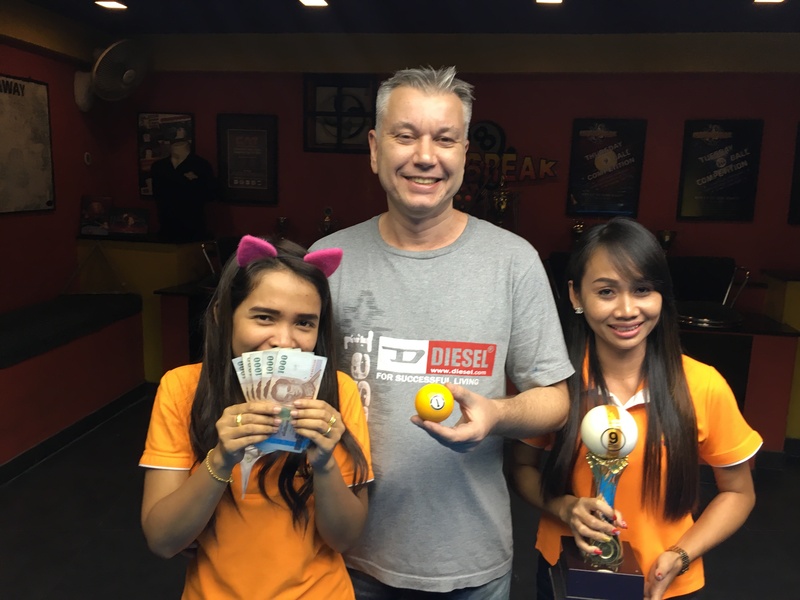 Mike, a regular with us every year over the winter months, was winning his first tournament here since December last year, pocketing the 1st Prize of 5000 baht. In the final he won the last four racks to beat local Thai girl Nid Mirantee Phukthamt in the deciding rack (race 7-4) and his handicap moves up to A+9 as a result. 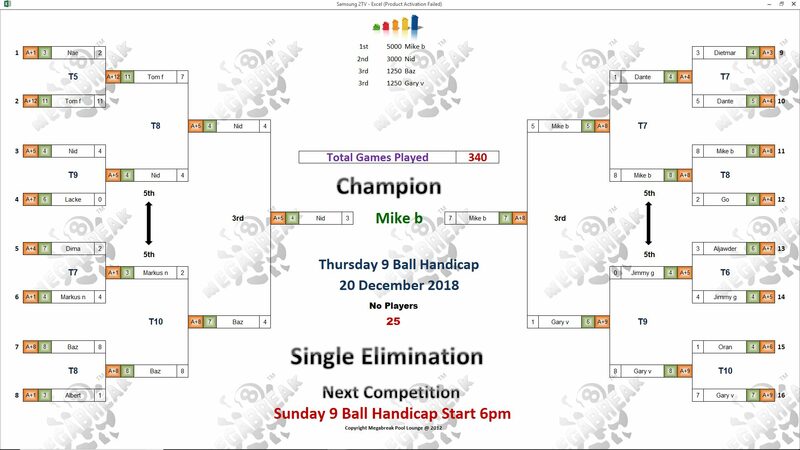 Nid played well to reach the final after losing out to Mike in their very first match of the night in the groups, but again came up short against him, and took home 3000 baht in 2nd Place. The other money winners on the night were Gary Vinson and Barrie Sherman, who each collected 1250 baht as losing semi-finalists. 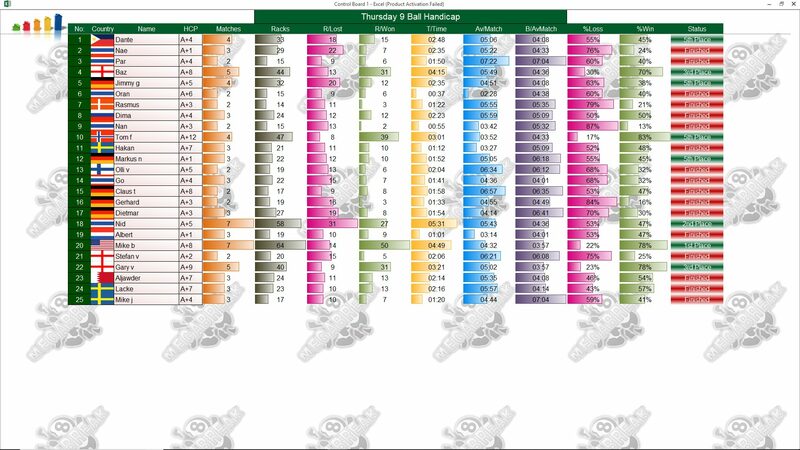 Gary’s handicap is increased to A+10 as a result. 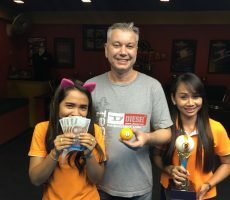 Champion : Mike (A+8) – 5000 baht. Runner-Up : Nid (A+5) – 3000 baht. 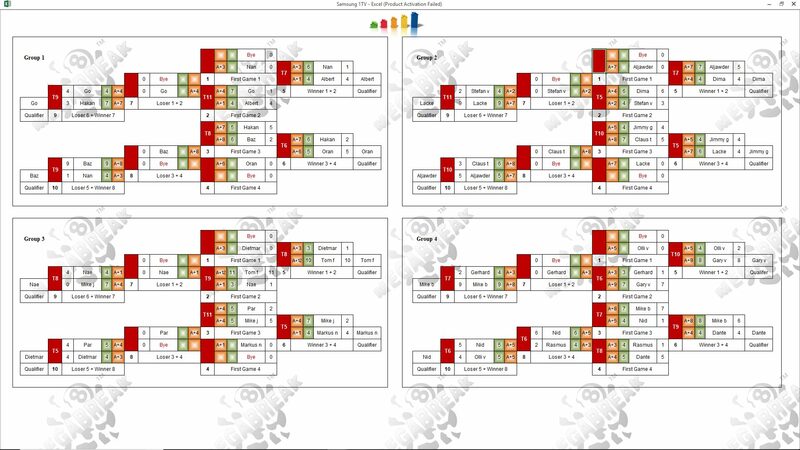 Semi-finals : Gary (A+9) and Barrie (A+8) – 1250 baht each. The Player Auction Prize Pot totalled 17500 baht and was won by Lacke Jonsson from Sweden. He bought Mike for the discount price of just 700 baht, and they shared the 1st Payout of 6800. 1st : Lacke (Mike) – 6800 baht. 2nd : Me (Nid) – 5000 baht. Equal 3rd : Gan (Barrie) and Olly (Gary) – 2400 baht each.